Respiratory disorders are a common cause of malady and demise in Pakistan due to its remoteness, cold and harsh climatic conditions as well as scarce health care facilities. The people rely upon the indigenous plant resources to cure various respiratory disorders. The primary objective of this review was to assemble all available ethno-medicinal data of plants used for respiratory disorders in Pakistan. Pharmacological activity of these plants (based upon published scientific research), distribution, diversity, use, preparation methods, economical value, conservation status and various available herbal products of some plants have also been explored. This study scrutinized various electronic databases for the literature on medicinal plants used in Pakistan to treat respiratory disorders. A total of 384 species belonging to 85 families used to treat respiratory disorders in Pakistan has been documented. Cough was the disorder treated by the highest number of species (214) followed by asthma (150), cold (57) and bronchitis (56). Most of the plants belongs to Asteraceae (32) and Solanaceae family (32) followed by moraceae (17), Poaceae (13), and Amaranthaceae (13) with their habit mostly of herb (219) followed by Shrub (112) and tree (69). Traditional healers in the region mostly prepare ethno medicinal recipes from leaves (24%) and roots (11%) in the form of decoction. Among the reported conservation status of 51 plant species, 5 were endangered, 1 critically endangered, 11 vulnerable, 14 rare, 16 least concern, 3 infrequent and 1 near threatened. We found only 53 plants on which pharmacological studies were conducted and 17 plants being used in herbal products available commercially for respiratory disorders. We showed the diversity and importance of medicinal plants used to treat respiratory disorders in the traditional health care system of Pakistan. As such disorders are still causing several deaths each year, it is of the utmost importance to conduct phytochemical and pharmacological studies on the most promising species. It is also crucial to increase access to traditional medicine, especially in rural areas. Threatened species need special attention for traditional herbal medicine to be exploited sustainably. Respiratory disease is a common and significant cause of illness and death around the world. 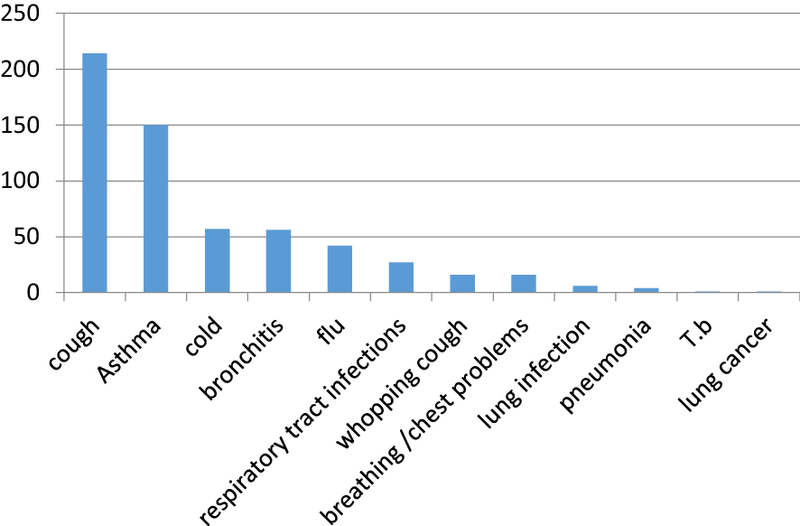 In 2012, respiratory conditions were the most frequent reasons for hospital stays among children. In Pakistan acute respiratory infections constitute 30–60% of outdoor patients in hospital including 80% upper respiratory tract infections and 20% lower respiratory tract infections. The most common problems of the respiratory system are: asthma, bronchitis, common cold, cough and whooping cough . Asthma affect about 300 million people worldwide and it has been estimated that a further 100 million will be affected by 2025 [2–4]. The prevalence of asthma in Pakistan is increasing day-by-day with an annual increase of 5% of which 20–30% are children. Nearly 20 million people (12%) of Pakistani adult population are already suffering from asthma while chronic bronchitis occurring in the population over 65 years of age was 14% in females and 6% in males. An estimated seven million cases of pneumonia occur every year in Pakistan and out of these, as many as 92,000 children die before their fifth birthday due to the infection. Respiratory disorders are common in Pakistan due to its remoteness, cold and harsh climatic conditions as well as limited health care facilities. The people depend on the indigenous plant resources to treat various respiratory disorders. Herbal remedies for the treatment of respiratory disorders are common practice in many parts of the world. Phyto-therapeutic agents are in use since ancient times for disease control but there use is greatly increased in last decade. By the end of twentieth century, 170 herbal drugs got official recognition. According to the WHO, 80% world population satisfy their primary health related needs by the use of phyto-therapeutic agents and 11% drugs are of plant origin among the essential drugs . Approximately 70–95% populations of developing countries use herbal drugs for basic health care . Pakistan is a rich producer of medicinal plants with more than 6000 species due to its climatic zones including high altitudes of Hindu-Kush Himalayas and Karakorum. About 600–700 (12%) species from the above mentioned figure are extensively used for medicinal purposes and various plants are also exported to foreign countries [7, 8]. From villages of Pakistan, 60% population use medicinal plants to fulfill their basic drug related needs . During the previous few decades there has been an increase in the study of remedial plants and their folk usage in various parts of Pakistan. In the recent years numbers of information are documented on the use of plants in indigenous healing system either by ethnic people or rural communities around the world and Pakistanis increasing. The knowledge of ethno pharmacology and its holistic approach supported by experience can serve as a fuel for the discovery of safe, new and affordable medicines. Drugs development on the basis of natural products had an extensive history in the US, and in 1991, almost half of the drugs with maximum sale were natural products or their derivatives. With the passage of time, the emphasis on plant research is increasing day by day and stronger evidences are collected that proved the extensive use of medicinal plants in TM. Approximately 13,000 plants are investigated in previous 5 years . The present study aimed at documenting the traditional uses of medicinal plants used to treat different respiratory disorders in Pakistan and to evaluate the efficacy of plant species based on the review of literature. What is the distribution and geographical patterns of medicinal plants used for respiratory disorders across the Pakistan? Which plant species are most often used for treating respiratory disorders? Which plant parts are most commonly used in ethno preparations? Which preparation modes are commonly used to prepare the medicinal recipes? Which respiratory conditions are most commonly treated with medicinal plant species? Have pharmacological studies been conducted to confirm the traditional use of the medicinal plants against respiratory disorders? Which plant species are used in herbal preparations for the treatment of respiratory disorders? What is the economical and conservation status of the plant species used for respiratory disorders? We believe that answering these questions will help to identify the plant species that have the potential to be explored in future lab trails. We also hope to highlight eventual under investigated areas. Published papers up till June 2015 were retrieved from the online bibliographical databases: PubMed, Google, Google scholar, Science direct, Springer link, IUCN redlist and drug Infosys. These databases were searched by using keywords like, traditional use of plants, medicinal uses of plants, indigenous use of plants, ethno botanical surveys and ethno-pharmacological studies of different areas of Pakistan (Provinces and districts). 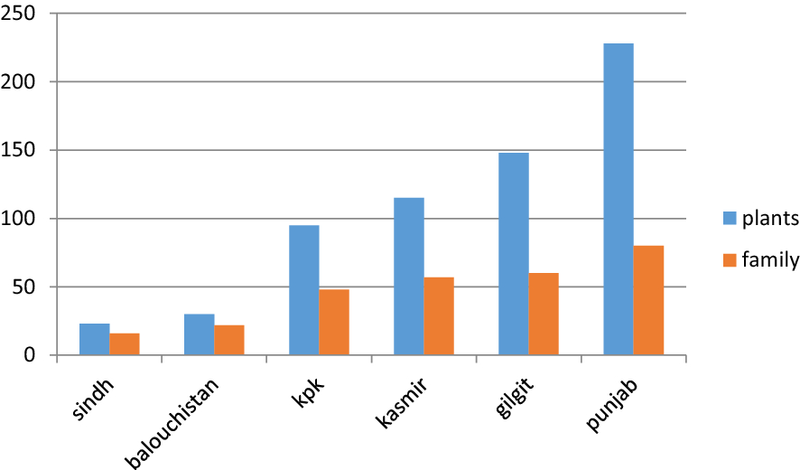 A total of 230 scientific papers based on ethno-botanical surveys of different areas of Pakistan were reviewed for this study (Punjab = 85, KPK = 58, Sindh = 15, Baluchistan = 8, Gilgit = 22, Kashmir = 42). Plants with the reported traditional usage against respiratory diseases were screened from the data gathered. A master list was generated enlisting all the medicinal plants used in Pakistan for the treatment of respiratory disorders (Table 1). Above-mentioned databases were also searched for pharmacological studies providing supporting evidence of medicinal uses for each species. Because of the massive number of studies been consulted only reference(s) were provided and complete information on pharmacological properties can be retrieved from the original studies. All the data has been summarized in six tables and six figures. Respiratory disorders have been divided into 12 categories depending upon the diseases enlisted in published research articles on ethno botanical survey of Pakistan. Diseases or categories consisting of similar disorders or pharmacological effects have been grouped as single category. The plant list was prepared on the Pakistan level as a whole by enlisting each plant only once that is being reported in different provinces for the same respiratory disease. The conservation status of plant species was determined following the IUCN red list categories and criteria version 3.1 (IUCN red list categories and criteria, 2001) and economical value of plant species were determined using scientific literature based on the commercial value of medicinal plants in Pakistan. Diversity of plants remains essential for human beings, providing numerous modern and traditional remedies to the healthcare system. It can be precisely assumed that the present day ethno-botanical pharmacology is as old as man himself. Different medicinal plants have been in use since the ancient time. Even in the present age of science and technology, people in the developed countries still rely on traditional system of healthcare not only because of its low price, but also due to very less side effects, as compared to the modern allopathic medicines. Pakistan is rich in natural sources including medicnal plants and most of inhabitants are in remote areas and have limited economical sources so they rely on the plants for their health care needs. Pakistan has been bestowed with distinctive biodiversity, consisting of a variety of climates, topographical regions, and ecological zones and holds rich diversity of medicinal plants used against various ailments . The present review reported 385 plants of 85 families from different regions of Pakistan being ethno-medicinally used for treating different types of respiratory problems. Majority of 228 plants of 80 families were reported from Punjab followed by 148 plants of 60 families from Gilgit, 115 plants of 57 families from Kashmir, 95 plants of 48 families from KPK, 30 plants of 22 families from Baluchistan and 23 plants of 16 families from Sindh. Many of the plants were used in more than one region; those plants were counted just one time while enlisting. Literature review elucidates that majority of plant species being used for respiratory disorders in Pakistan belongs to Punjab. This botanical diversity from Punjab might be owing to its varied climate and soil types . The distribution of plants in different regions of Pakistan is shown in Fig. 1. A large portion of Ethno botanical overview have been accounted for from 30 districts of Punjab followed by 18 districts of Khyber Pakhtunkhwa, 12 districts of Baluchistan, 9 districts of Sindh, 7 districts of Gilgit Batistan, 10 districts of Kashmir. Still there are number of under-investigated districts that need to be surveyed for ethno botanical studies including 6 districts of Punjab, 8 districts of Khyber Pakhtunkhwa, 20 districts of Baluchistan, 20 districts of Sindh and 1 district of Gilgit Batistan. Another reason for majorty of the plants from Punjab might be that ethnobotanical surveys have been reported from maximum areas of Punjab except a few, while some regions of Northern areas and many areas of Balochistan and Sindh have not so far been explored concerning ethnobotanical knowledge. A list of investigated and under-investigated districts has been mentioned in Table 2. A total of 384 medicinal plants of 85 families were found in the literature that are being employed for the treatment of respiratory diseases in Pakistan. The most commonly used plants were member of Asteraceae family (32) followed by solanaceae (32), moraceae (17), Poaceae (13), Fabaceae (13), Amaranthaceae (13), Lamiaceae (12), rosaceae (11), Violaceae (10), ranunculaceae (10), Asclepiadaceae (10), Euphorbiaceae (9), apiaceae (9), polygonaceae (9), Malvaceae (8), Acanthacea (8), brassicaceae (8), Boraginaceae (7), liliaceae (6), Capparaceae (5), Labiatae (5), Mimosaceae (5), Papilionaceae (5), Myrtiaceae (5) and 10 families contain 4 plants, 9 families containg 3 plant species, 12 families consisting of 2 plant species and 28 families contain 1 plant species. 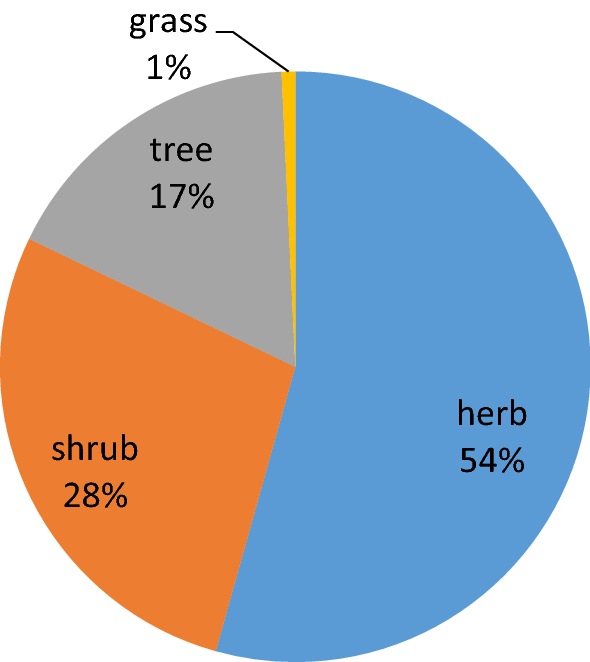 The results, in terms of percentage, of plants in each family are represented in Fig. 2. Asteraceae holds the top position among the families used in ethno-medicines which indicates the presence of effective bioactive ingredients in the members of this family . This predominance could be explained by worldwide highest number of species (23,000 species and 1535 genera) of this diverse family found in almost every habitat of all countries except Antarctica [14, 15]. Various secondary metabolites have been reported to be present in the members of this family especially sesquiterpene lactones, in addition to volatile oils and terpenoids [16, 17]. Perhaps these secondary metabolite profiles, together with the large number of species, are primarily responsible for the relevance of this family in traditional medicine. The prevalence of asteraceae family in medicinal use is not a new finding as studies from various other countries also reported similar results [18, 19]. Many species of asteraceae family are typically identified as weeds occurring in anthropogenic environments and are among the first species to emerge in the field after the soil is prepared for planting. This may contribute to the high rate of citations of species of this family in rural communities where the home gardens are the main source of medicinal plants . Most of the medicinal plants used in ethno medicine for treating the respiratory disorders are herbs (219) followed by Shrub (112), tree (69) and only three (3) plant species are being documented as grass. Habit of plants in different regions of Pakistan is shown in Fig. 3. This predominance of herbs as a source of herbal therapies is often attributed to the fact that their high ethno botanical studies could be an indication of their abundance easy availability and the traditional knowledge . Whilst shrubs and trees seem to be preferred because of their availability round the year and they are resistant to drought and seasonal variations . Majority of herbal recipes include trees and shrubs due to their easy accessibility round the year, followed by utilization of herbs which might be related to their easy collection methods, higher abundance and efficacy in curing ailments as compared to other life forms [23, 24]. Thus variation in the use of medicinal plants growth form might be associated with the difference in socio-cultural believes, ecological status and variations in the practices of traditional healers. It has also been revealed after literature review that leaves (131) are most commonly used in ethno medicine for the treatment of respiratory disorders. 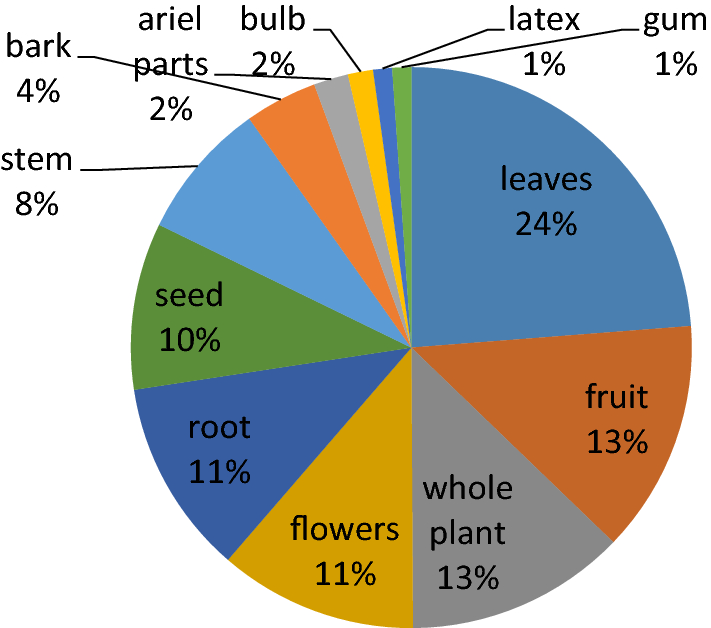 While other plant parts use frequencies are as follows, fruit (74), root (62), seeds (53), whole plant (70), stem (44), flowers (63), bark (23), and latex (6), and gum (6). 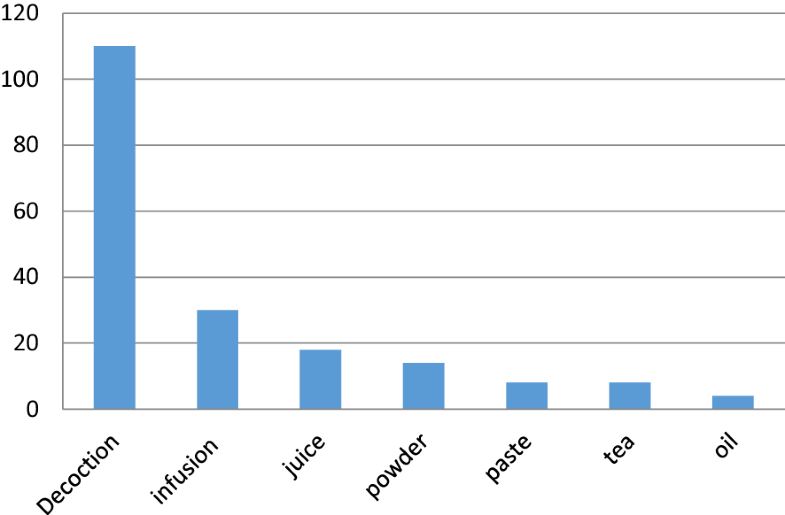 Frequency of use of different plant parts are shown in Fig. 4. Preference of leaves over the other plant parts is commonly thought to be due to the reason that leaves are the photosynthetic organs containing the photosynthates which might be accountable for their medicinal values [25, 26]. It is may be due to the reason that the collection of leaves does not affect the life cycle of plant so it is preferred to use the leaves in ethno-preparations . Fruit was the second most commonly used plant part according to the literature of Pakistan. It has also been reported in different studies that Fruit is being commonly used by Americans as well . Roots were the third frequent used plant parts which may be due to the reason that active constituents are rich in roots [29, 30] but the collection of underground parts of the plant is not viable as it affects the plants life and such plants are considerd as highly threatened [31, 32]. The overview of ethno-botanical literature of whole country reveals that different plant parts are being used of the same plant in different areas which is may be due to the availability, ease of collection or ethnic believes of local people. The reported plants were used in 12 different respiratory disorders. The highest number of medicinal plants documented are being employed in the treatment of cough (214) followed by asthma (150), cold (57), bronchitis (56), flu (42), respiratory tract infections (27), whopping cough (16) and breathing problems (16). Percentage of plants used in ethno-medicine for the treatment of different respiratory conditions is shown in Fig. 5. Different recipes are being used by local peoples for the use of medicinal plants but most common mode of preparations of phytomedicines are decoction (110), powder (14), juice (18), infusion (30), paste (8), tea (8) and oil (4). Different mode of preparation of the plants is shown in Fig. 6. Decoctions are prepared by boiling the plant in water until the volume of water is reduced to half. Previously studies reported that decoction and infusion predominates  because these preparations are rapid to prepare, inexpensive and easy to consume. In addition, high usage of decoction might be related to their proven efficacy over many years’ trial and indigenous knowledge accumulated on effectiveness of such preparations. Even though the literature was scrutinized exhaustively, there was missing information regarding the mode of preparation of ethno medicine. Many ethno-botanical studies published include raw lists of plants used medicinally, only indicating which parts are used for what ailments. Detailed preparation and application are rarely mentioned. These types of studies do not reveal the ideas underlying the use of the cited medicines nor do they explain why certain plants were selected. It is necessary to include precise medicinal indication for each species in future ethno-botanical studies in order to be able to reproduce the traditional preparations and understand their modes of actions. For example, individuals of the same species collected at different localities, in different seasons, even various times of the day and night or at different stages of growth might have strikingly different levels of active compounds . Comprehensive information about both the collection and handling of each plant remedy needs to be meticulously recorded. An attempt has been made to investigate the pharmacological activity of the enlisted plants from available literature to confirm their traditional use against respiratory conditions. Only 53 plants out of 384 have been found on which pharmacological studies were conducted to evaluate their anti-inflammatory, immunomodulatory, smooth-muscle relaxants, anti-allergic, anti-histaminic, mast cell stabilizing, bronchodilator and antioxidant properties as these properties are useful for the treatment of respiratory conditions . Remaining 331 species mentioned in the table still needs to be pharmacologically evaluated in order to confirm their folkloric claim. Medicinal plants evaluated for pharmacological effects have been mentioned in Table 3. Artemisia scoparia Waldst. and Kit. Herbal formulations are the finished labeled products containing active ingredients or plant material or combination of medicinal plants . With the increase in demand of traditional medicine, worth of herbal industry is also increasing day by day . Local healers from different areas use different plants in various combinations to treat respiratory conditions. Some plants mentioned by tribal healers for the treatment of respiratory conditions are known to be used in the preparation of popular herbal medicines. Among such plants are Achyranthes aspera, Adhatoda vasica, Glycyrrhiza glabra, Viola odorata and Onosma bracteatum. The major domestic manufacturers like Hamdard, Qarshi, Ajmal and others produce 300–400 herbal products. A list of 17 commercially available herbal medicines used for respiratory conditions with their composition is mentioned in a Table 4. In recent time it is important to collect the valuable knowledge from local folklore regarding medicinal use of plants to treat respiratory conditions and give more focus on the useful pharmacological evaluation of medicinal plants for their protection, usefulness and effectiveness of this disease. During the investigation of conservation status of medicinal plants used against respiratory conditions in Pakistan 51 plant species were evaluated through IUCN Red list categories and criteria. Among these species 5 were endangered, 1 critically endangered, 11 vulnerable, 14 rare, 16 least concern, 3 infrequent and 1 near threatened. Conservation status of 51 medicinal plants is mentioned in Table 5. Non-scientific and indiscriminate collection of medicinal plants in various parts of the area has led to the severe pressure on the availability of medicinal plants. Using the part like roots, rhizomes, bulbs could also be a severe threat for reproducing medicinal plants of the area. Unplanned collection, loss of habitat, increased exploitation and unsustainable harvesting, intensive grazing, and land leveling for agriculture, deforestation and erosion attack of pathogens were the major threats to the medicinal plants. According to IUCN threatened plant data base, about 32,000 species of plants are threatened with extinction. This figure represent 13% of estimated 250,000 of plants It is stated that rate of plant extinction has reached to one specie per day as a result of mentioned threats and it is considered 1000–10,000 time faster than that would occur naturally. If the trend remains constant, 60,000 and 100,000 plant species may disappear in the near future [38, 39]. So in order to save these medicinal plants some important measures should be taken. Government should distribute saplings each year among the villagers to plant them. Media should be used to save nature and its importance. Establishment of nurseries and botanical garden as well as local community awareness and involvement to protect these national assets will be the best conservation measure. Among the 384 plants used against respiratory diseases 58 plants belonging to 32 families were commercially important and are a source of income for the local community. These plants are used as drugs for treating respiratory diseases in traditional system of medicine. The detailed list of local uses, part used price and commercial status for each plant is mentioned in the Table 6. The prices of each species vary from year to year and also depend on demand and supply. There was an increase of three to fivefolds in prices from collectors to the national market . In 2006 global trade of medicinal plants reached US$ 60 billion. Europe alone annually imports about US$ 1 billion from Africa and Asia. Such trade is expected to expand substantially by the year 2050 because of the increasing popularity of herbal medicines. Pakistan exports of high value plants generate over US$ 10.5 million annually in 2012, with a substantial percentage of the supply coming from Swat District . Approximately 300 plant species are being traded in Pakistan of these were 22 medicinal plant species worth 14.733 million Rs were traded in 1990 while it was increased by 8.5 folds (122 million Rs). The geographical location of Swat District provides an ideal physical environment for the growth and nourishment of many high value medicinal and aromatic plants. These medicinal plants can make a contribution to the economic development of the area in particular and the country in general . Market share of Pakistan has been declining due to unreliable and often poor quality of the material supplied, length of the supply chain, and poor marketing strategies. The availability of medicinal plants drastically decreased due to increased marketing pressure on medicinal plants, lack of job opportunities in the area, non-sustainable harvesting methods like digging of whole plant and increased population of the area. So to maximize the exports and benefits of medicinal plants, trade monitoring, equitable sharing of benefits of wild resources, improved control on harvesting and trade for the conservation of resources, enhancement of cultivation efforts, future research into trade in wild harvested plants, community participation in natural resource management and value addition in the herbal products are recommended . In this review, we described the medicinal plants used in Pakistan to treat respiratory disorders. Local people are using plants without any scientific base. There is a gap between traditional use of plants and pharmacological evaluation as well as very limited number of phytochemical studies has been documented. In recent time it is important to collect the valuable knowledge from local folklore regarding medicinal use of plants to treat respiratory conditions and give more focus on the useful pharmacological and phytochemical evaluation of medicinal plants for the isolation of novel compounds as well as for their protection, usefulness and effectiveness of this disease. We examined investigated areas across Pakistan in relation to medicinal plants richness and based on this we provide recommendations for the areas that should be targeted in future ethno-botanical surveys. From the review of literature it is deduced that proper documentation of data was lacking in several research articles studied. There were many spelling mistakes in the plant names and families. Life form, part used and mode of preparation for herbal remedies were also not stated in many published ethno-medicinal surveys. So in future ethno-pharmacological research with comprehensive information should be carried out in the under investigated areas to save the traditional knowledge and to take it to the light of science. Appropriate measures should be taken to increase the market share of Pakistan as well as to maximize the exports and benefits of medicinal plants. Properly monitored trade and marketing for stability in product supply, unbiased sharing of profits of wild resources, improved control on harvesting and trade for the conservation of resources, enhancement of cultivation efforts, creation of new markets for various products so as to profit the public, implementing rules and regulations at public level to facilitate attaining goals of economic development and ecosystem conservation, community participation in natural resource management and value addition in the herbal products are recommended. Government should distribute saplings each year among the villagers to plant them. Media should be used to save nature and its importance. Initiating afforestation projects and controlling over grazing. Reducing biotic pressure by supplying gas and electricity. Establishment of nurseries and botanical garden as well as local community awareness and involvement to protect these national assets will be the best conservation measure. Commercial exploitation of medicinal plants should make sure to safeguard the intellectual property rights of local people. Providing educational material in native languages to update collectors about occurrence of medicinal flora, their therapeutic significance, and market values. It is important to identify valuable species, precisely map their distribution, document their status, study their life cycle, and formulates guidelines for their conservation and management. In essence, the current investigation identified that people from Pakistan discern and make use of 384 therapeutic plants, belonging to 85 families for respiratory disorders. Keeping in view the results, Asteraceae family contains more plants and herbs are the dominant life form, whereas among the parts, leaves have been maximally used in decoction form for the treatment of respiratory disorders. Moreover, 17 plant species are being frequently used by the manufacturers in different herbal products for the treatment of respiratory disorders and only 53 plants have been pharmacologically evaluated while 51 plants are in the IUCN threatened list as well as 58 plant species have reasonable commercial significance. This review will not only provide a baseline data for initial screening of promising plants used in respiratory disorders but also will be helpful for conducting phytochemical studies by the application of ethno botanical indices. The study also provides recommendations for the areas that should be targeted in future ethno-botanical surveys. The need of hour is to implement productive policies for the careful use of valuable ethno botanical inheritance of Pakistan and to fill the gap between ethno-medicine and pharmacological research, to fully elucidate promising significances of plant-derived medicines on public health. All the authors have contributed equally in conducting research work and in writing research paper. All authors read and approved the final manuscript. The authors acknowledge the financial support of Prince Abdullah Ben Khalid Celiac Disease Research Chair, Vice Deanship of Research Chairs, King Saud University, Riyadh, Saudi Arabia. All the data collected is presented in the paper.